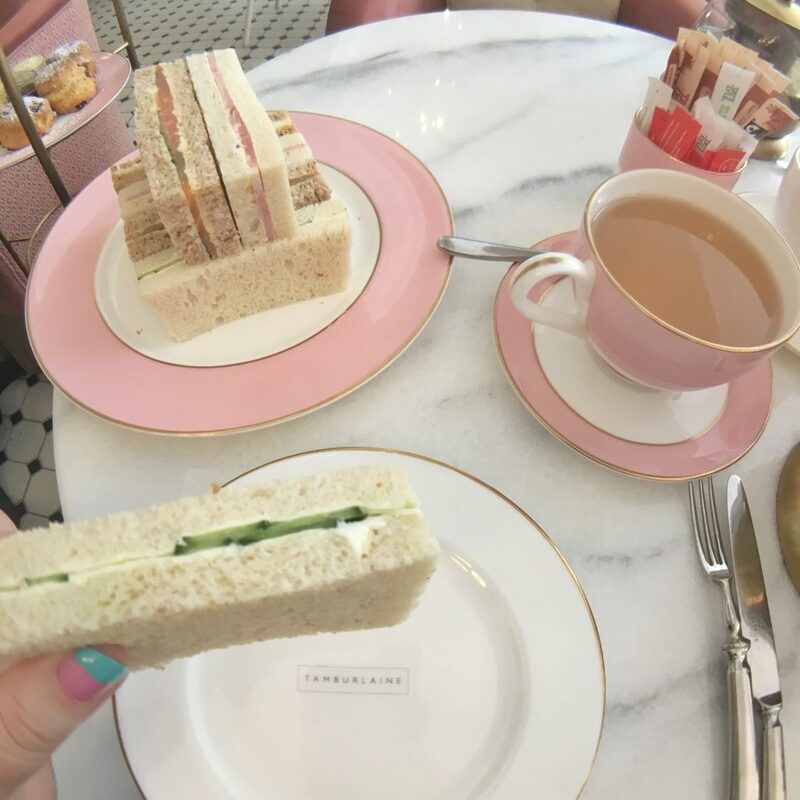 I often get asked where is the best afternoon tea in Cambridge? And in all honesty, I have very few favourites when it comes to Cambridge itself. 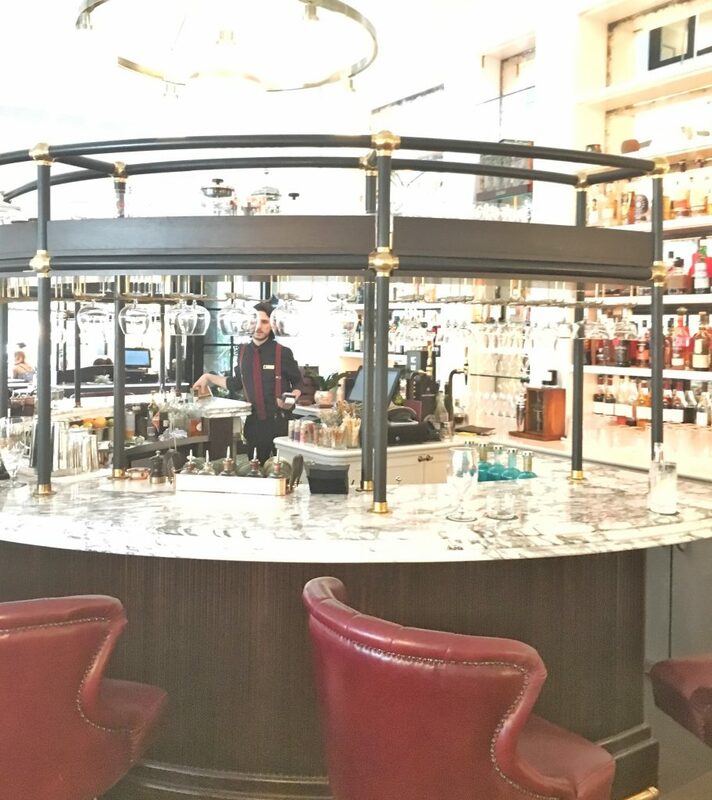 Until recently Cambridge has really been lacking in fantastic afternoon teas and until The Ivy Brasserie and Carriages of Cambridge came along there haven’t been many other contenders. 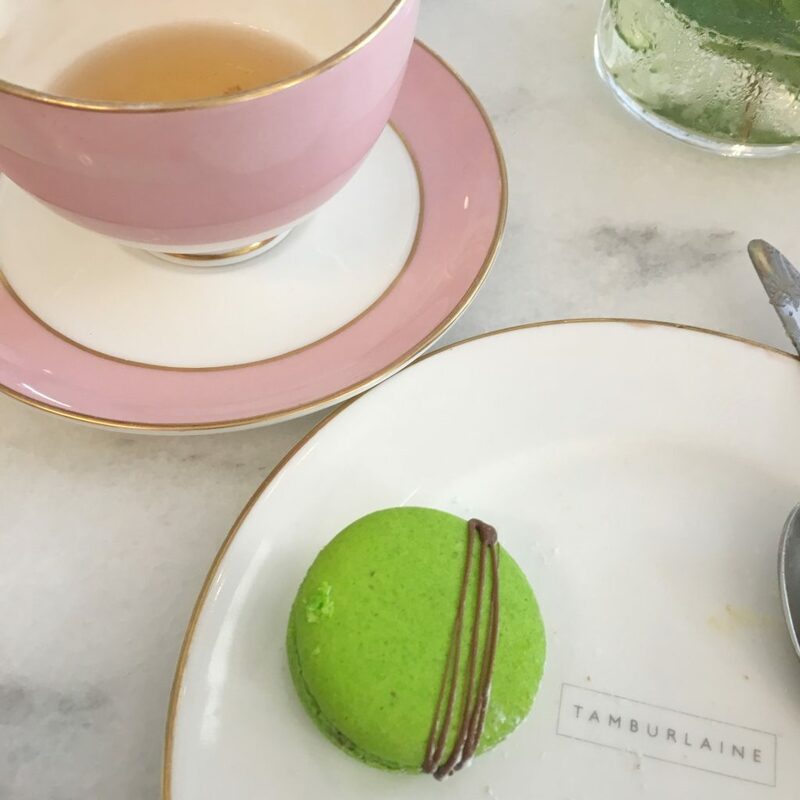 I recently received an invitation to sample afternoon tea at one of the newest hotels in town, The Tamburlaine. 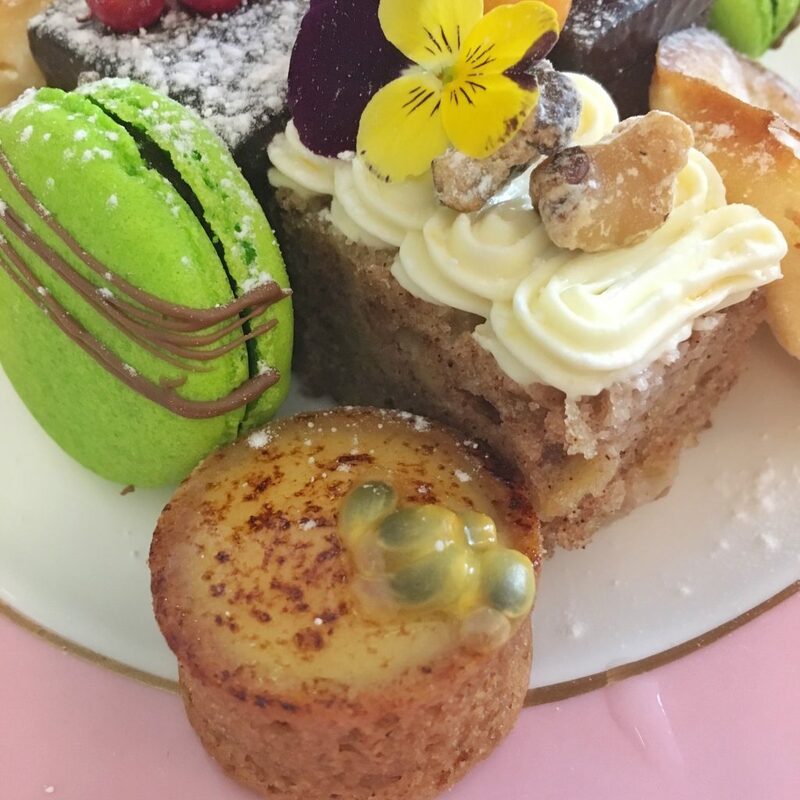 This is the new kid on the block when it comes to afternoon tea destinations in Cambridge. 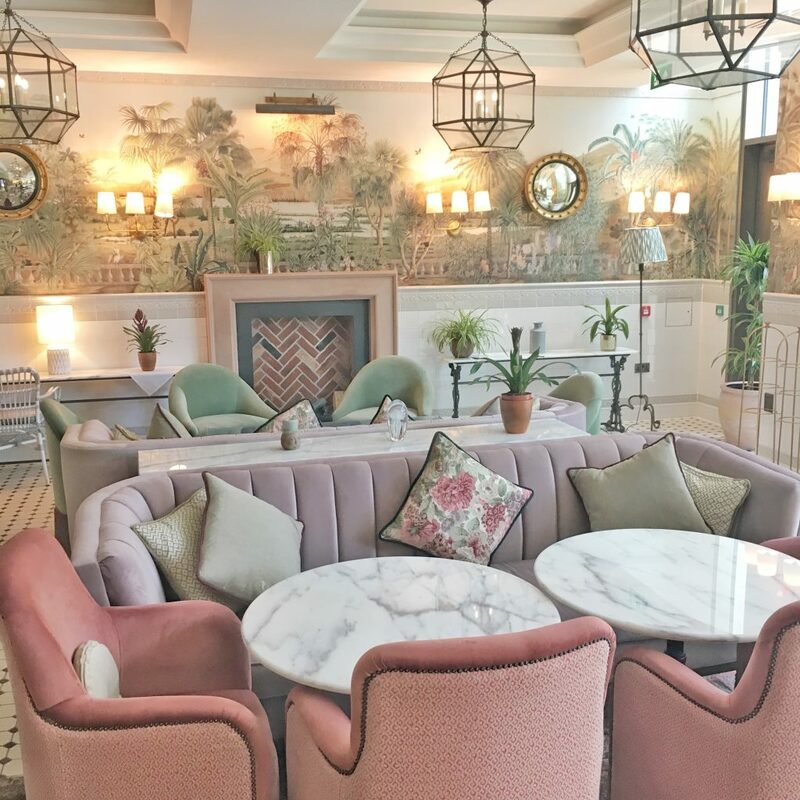 I say new, this hotel has been open for a year or so now, but I’ve only just got around to visiting… and I’m so glad that I did, wow, this is a beautiful venue for afternoon tea. 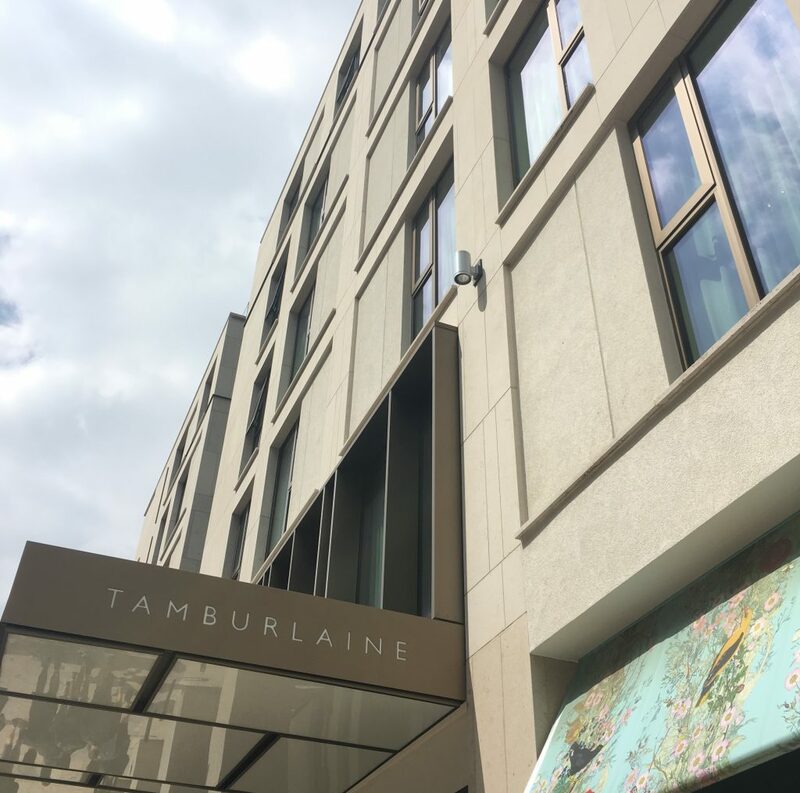 You could easily walk past The Tamburlaine as you head from the railway station to town, however the colourful canopy beside the swivelling front door offers a simple, but elegant insight as to what is awaiting you inside. 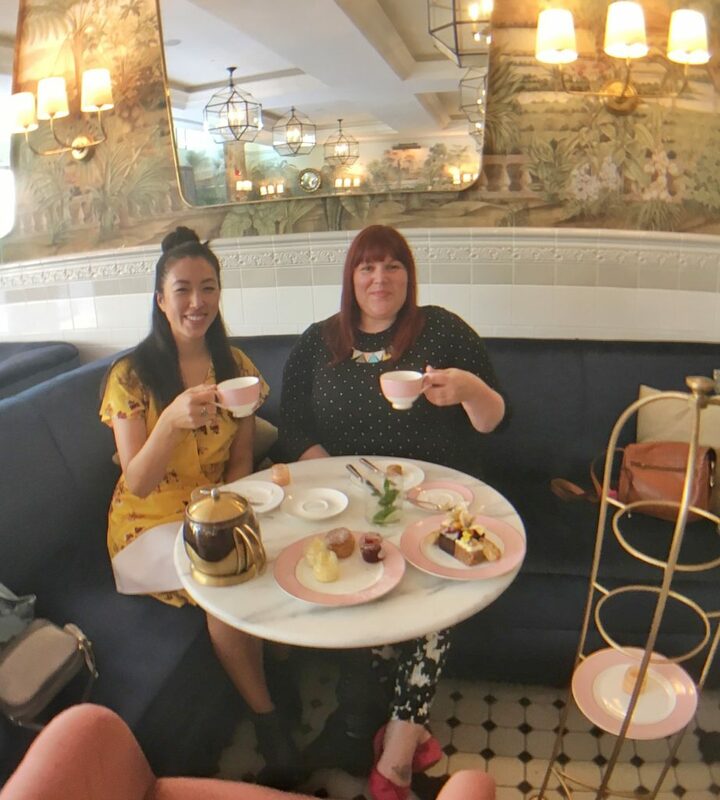 I was very lucky to be invited to sample this afternoon tea and I decided to invite my lovely friend, Jennifer Chong of Feioi Interiors, along for a sophisticated afternoon out on the town. 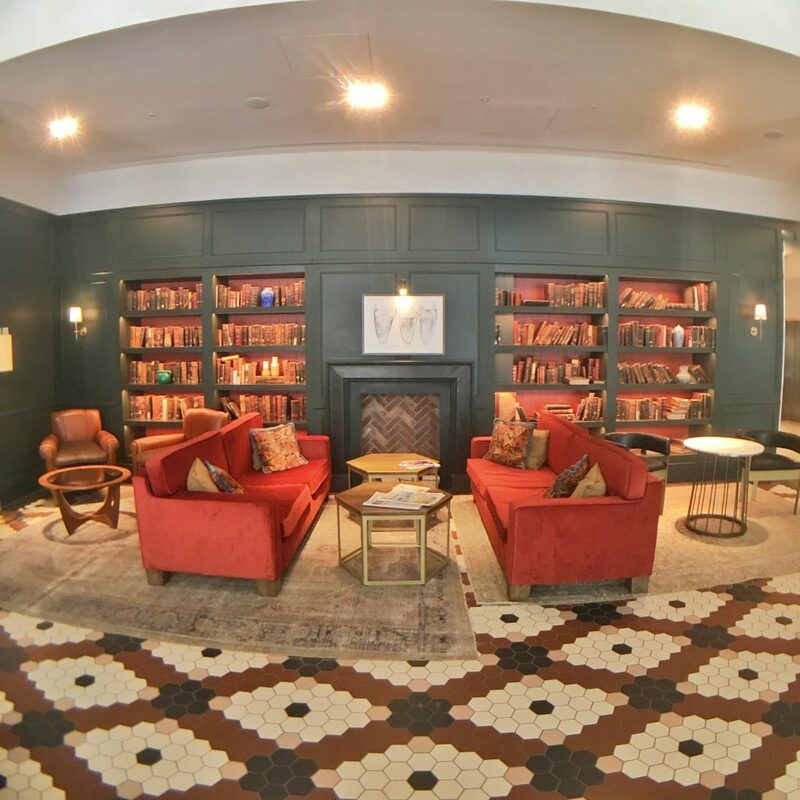 On arriving at this luxury hotel, I was greeted by a very friendly doorman who showed me around whilst I waited for Jen to arrive and he suggested that I take a sneaky peek upstairs into the stunning, yet secluded library. 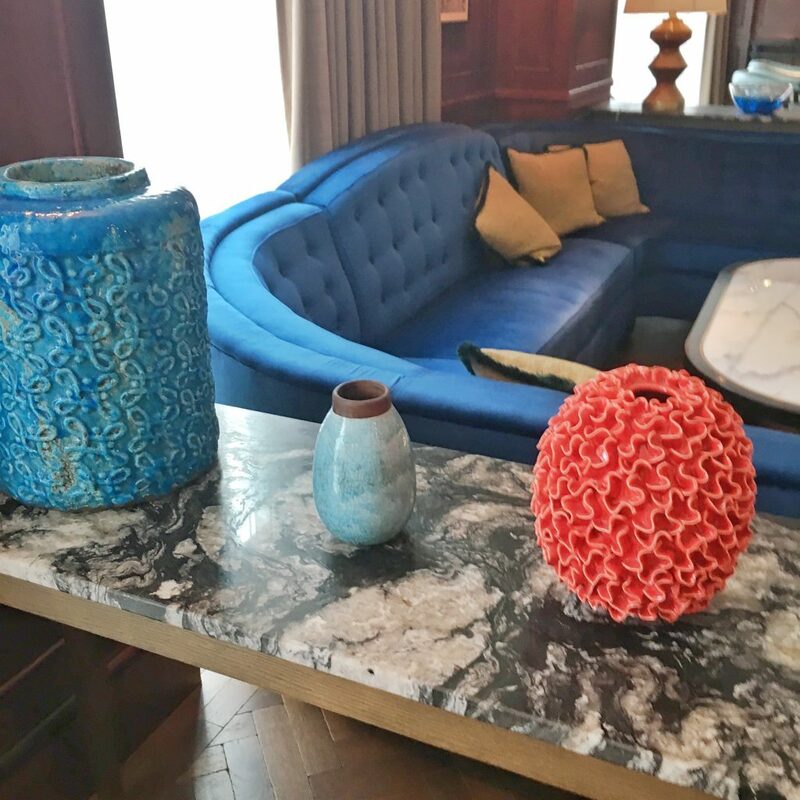 The interior design from the very moment that you enter this hotel is very different to anything that I’ve seen in Cambridge. 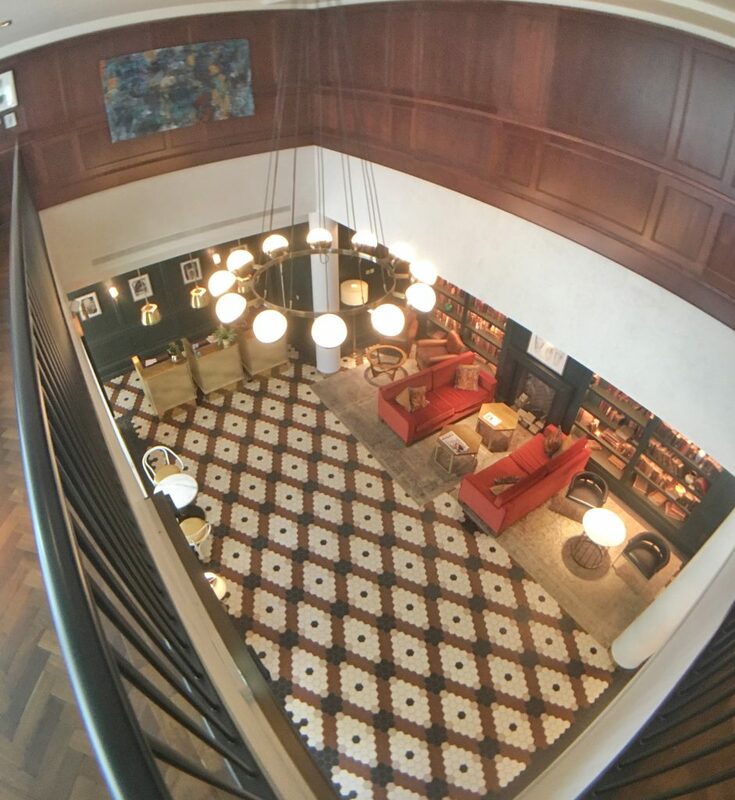 I really like the art deco feel…every corner has an intriguing detail or a splash of colour. It’s bold and I love that, keeping in mind until a few years ago I was very much a lover of monochrome schemes. 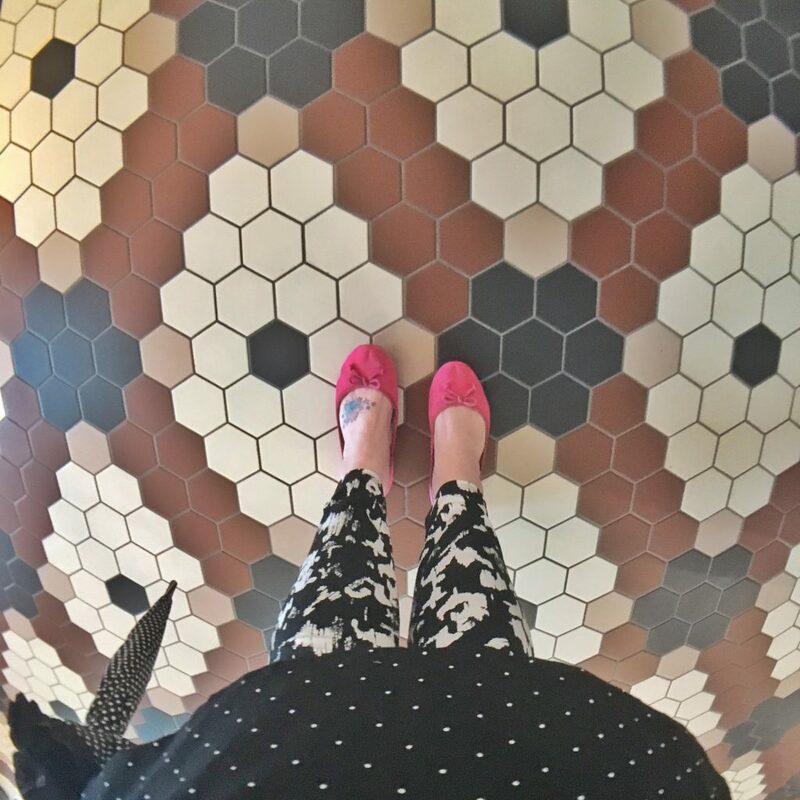 I’ve been drawn more and more to bold textures and colours since buying my first home, so I felt right at home here. 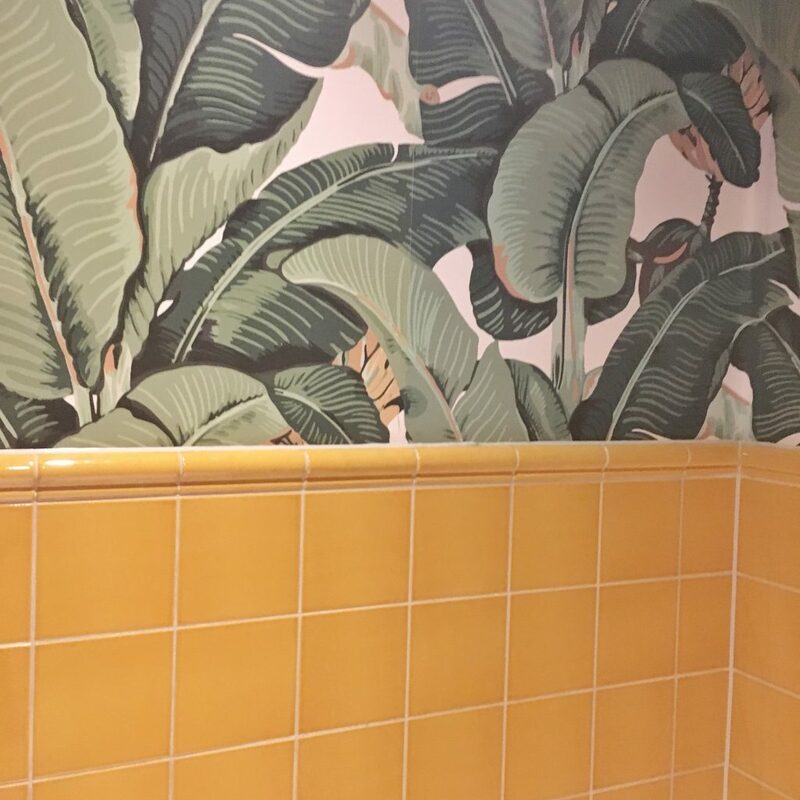 Covered in a banana leaf print wallpaper and yellow tile, this room looks like something from my Pinterest boards and I couldn’t stop photographing it haha. 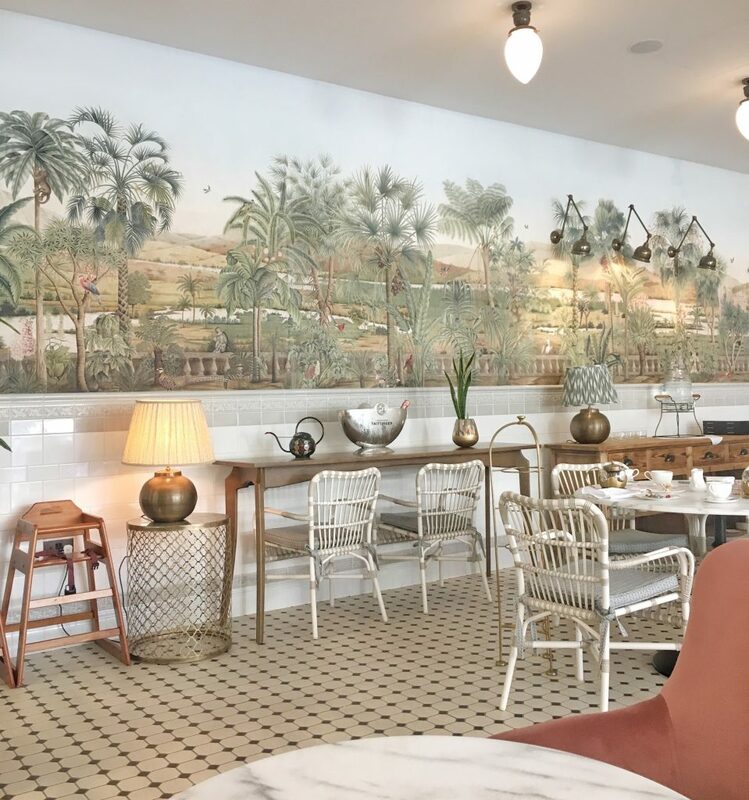 The patterned tiled floors, the plush velvet sofas adorned with cushions & throws and the stylish, but simplistic artwork on the walls all make this hotel a piece of art in itself. 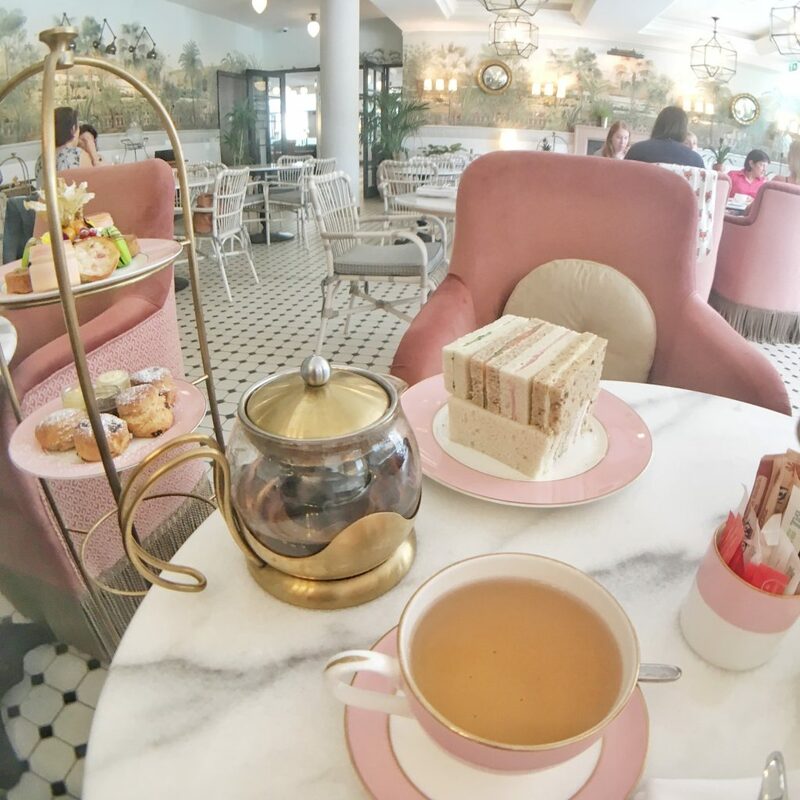 But the pièce de résistance is truly the garden room, one of the most relaxing afternoon tea venues I’ve ever spent time in. 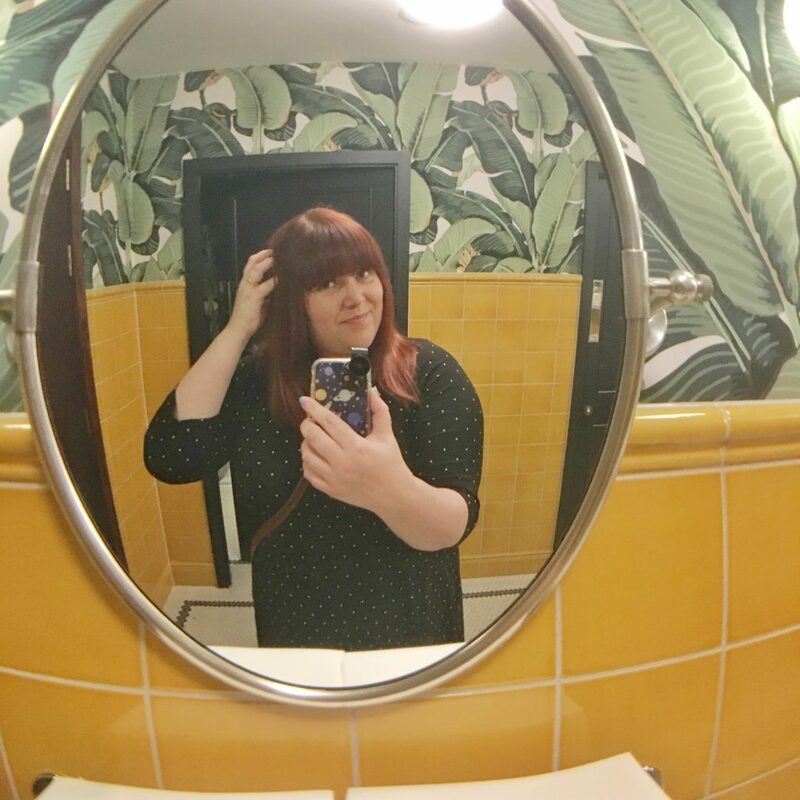 Victorian patterned wallpaper, huge walls decked with mirrors and ornate light & lamps everywhere you look. 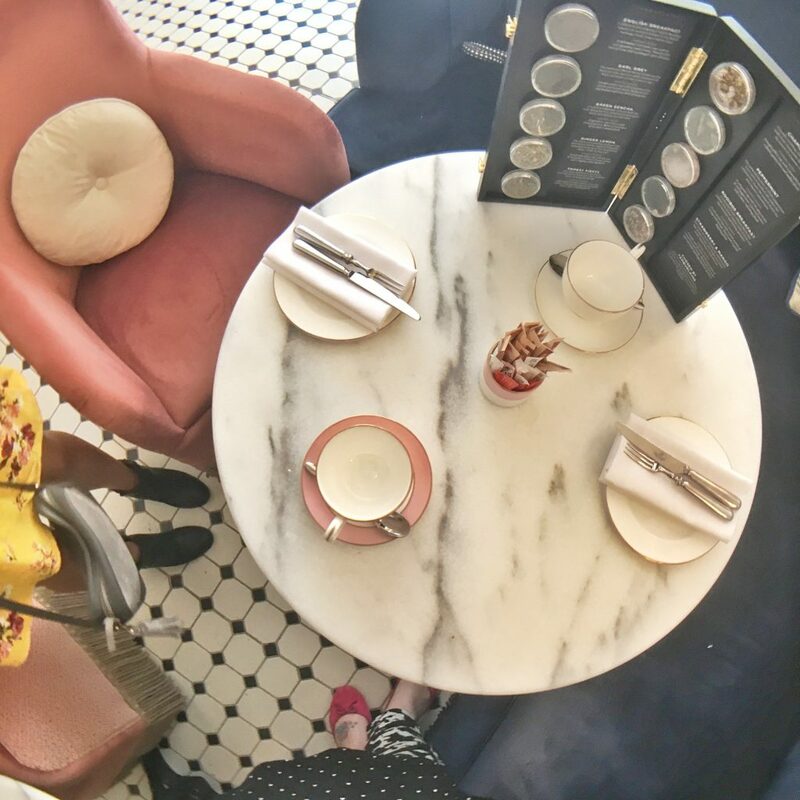 Marble tables, their very own pastel china & tableware embellished with their logo and the cutest pastry forks I’ve ever seen… we even joked about popping them into our handbags before we started to dine – obviously we would never do that! Much to my delight, the loose leaf tea on offer is Newby Tea, originally based in London, but I’ve seen them expanding hugely over this last year or two. 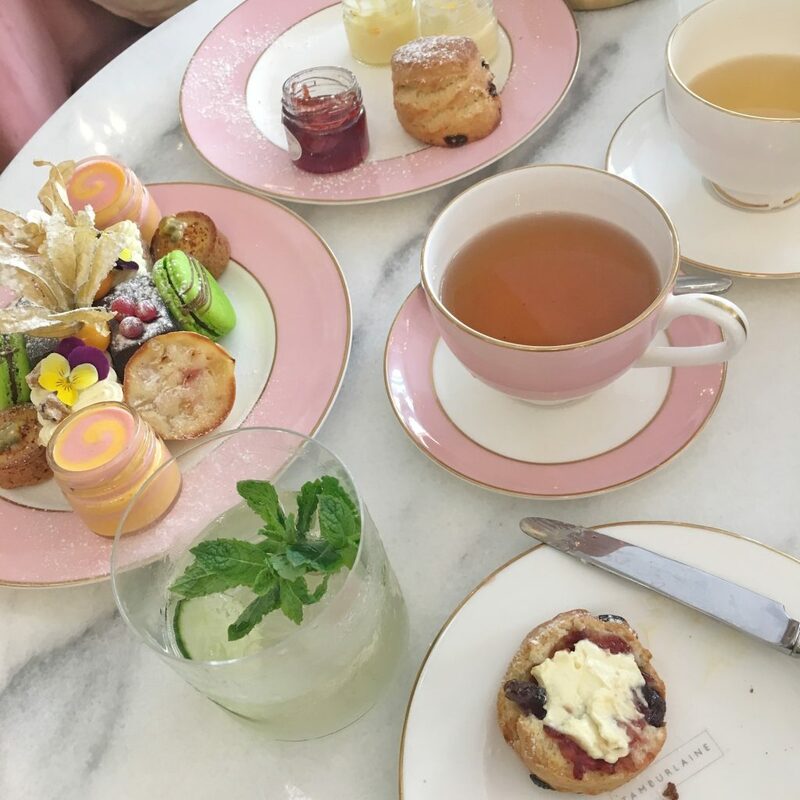 I had the pleasure of sampling this tea at an event sponsored by Newby in London a few years back for National Afternoon Tea Week and it is truly one of my most favourite brands of tea. 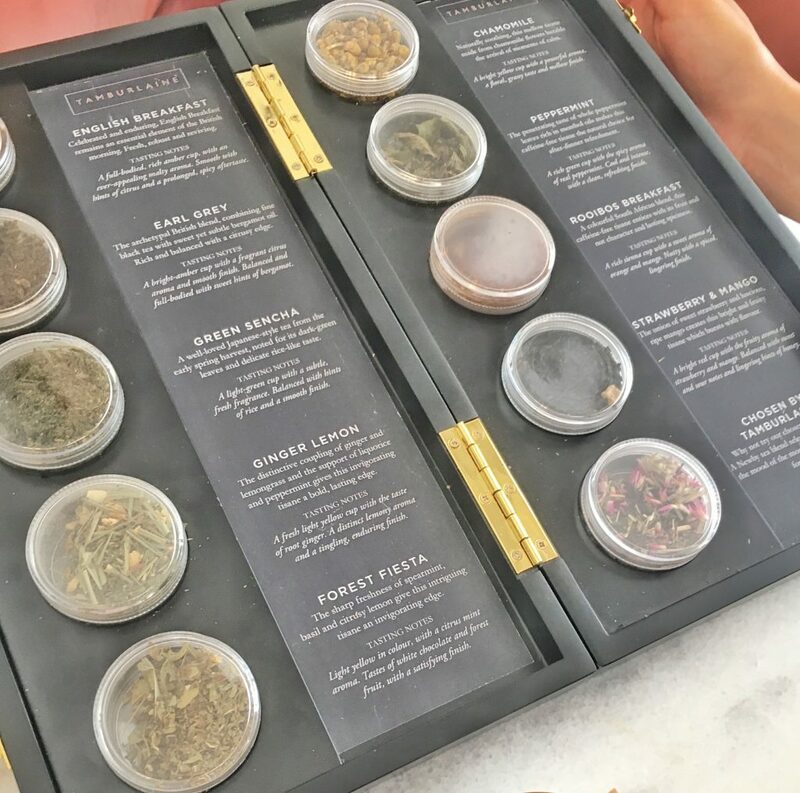 There were many different options on the tea menu here, including the usual suspects such as English breakfast and Earl Grey, as well as many flavoured/fruity options such as strawberry & mango, lemon & ginger, and a seasonal blend of lavender tea produced especially for The Tamburlaine. I chose the lavender tea, it was light, full of flavour, but not too overwhelming. However, after the second pot of this tea it started to tickle the back of my throat, so it did get a little too much after a few cups and I needed to switch to a different flavour. This hasn’t put me off, quite the contrary, it’s one of the best teas I’ve ever tasted and I would love to recreate this one at home. I may have to get in touch with Newby and have a chat, as I’d love to join them for a tea tasting masterclass – I adore their originality. 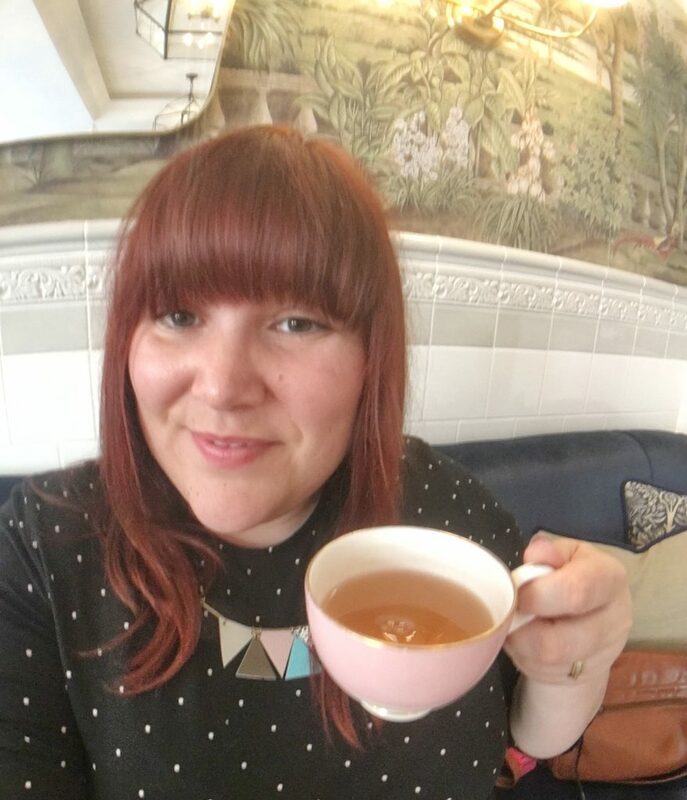 Jen enjoyed the lemon & ginger tea and thoroughly enjoyed downing two pots during our stay. 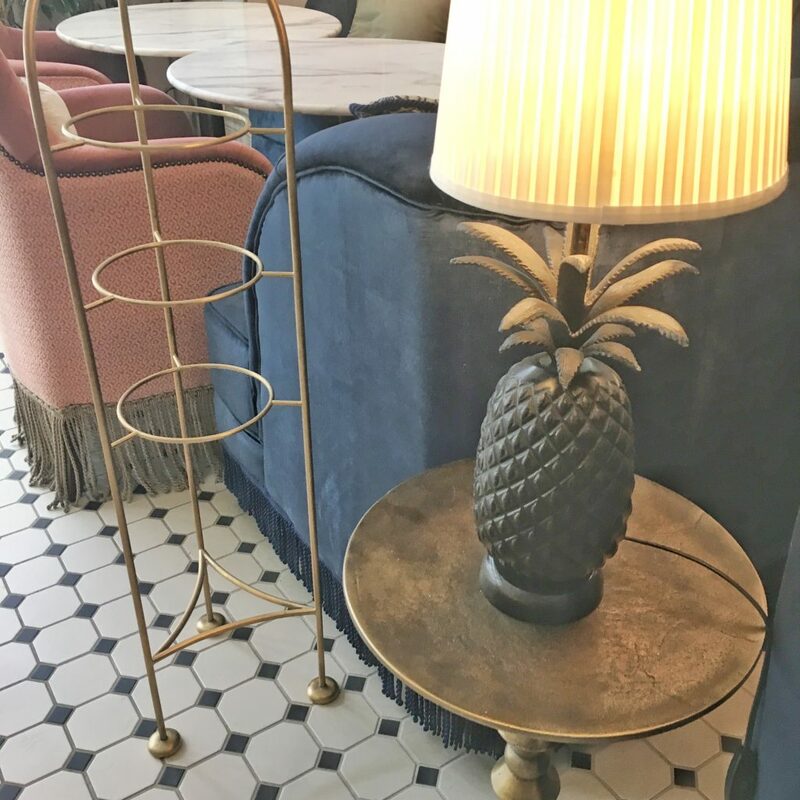 Large brass cake stands almost twice as tall as the table that we were seated stood proudly on the black and white tiled floor beside us. 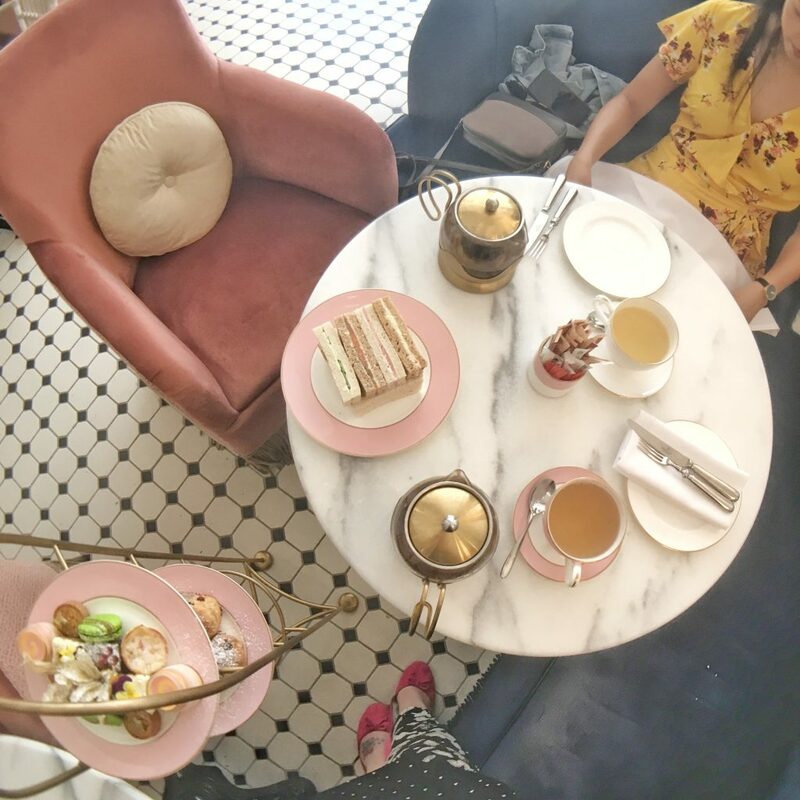 On serving afternoon tea, our knowledgeable waitress pulled it up alongside us and placed each of the plates onto the stand which really gave the afternoon tea a wow-factor arrival. Each plate could be taken from the stand and placed on the table as we nibbled, I love this as there’s nothing worse than a small table with no room to place everything. Once we had emptied a plate, we could pop it back on the stand to move it out of the way – genius! 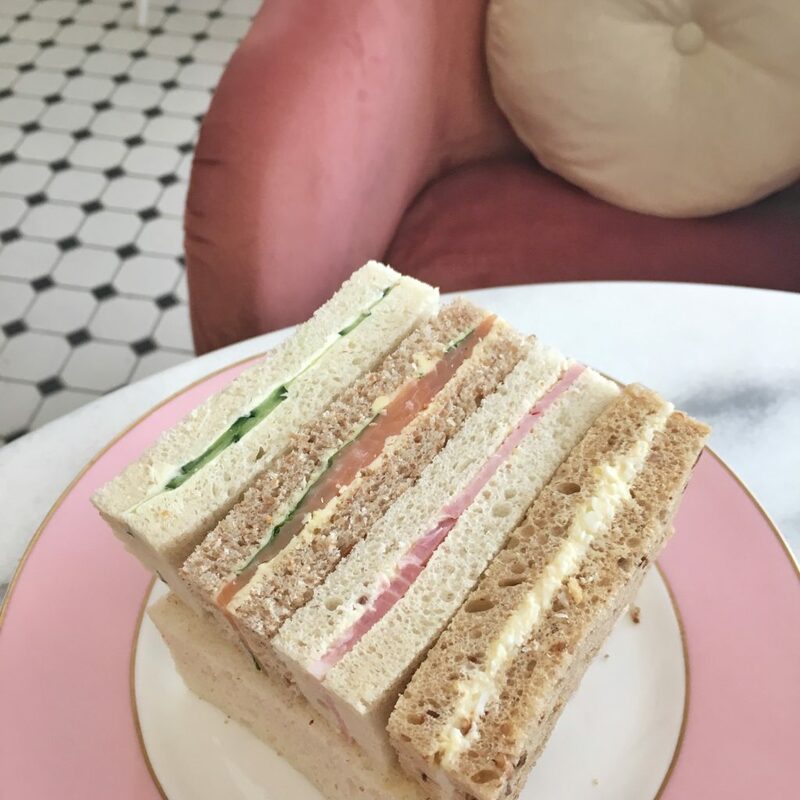 The finger sandwiches were beautifully cut into rectangles, all matching and symmetrical, piled on top of each other like a sophisticated Jenga tower – so impressive. 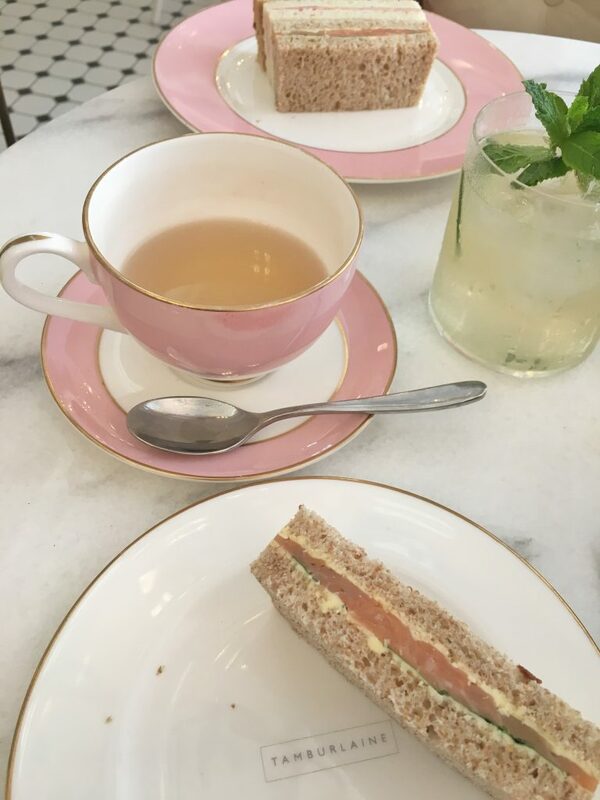 We were served four generous-sized finger sandwiches each, with fillings which included smoked salmon & spinach, a simple egg mayonnaise, cucumber & cream cheese and ham & mustard. They were freshly made, no dried out corners on these beauties! As with all afternoon teas, I always find there is never enough savoury. It’s exactly the same here, I would perhaps suggest a very small savoury tart or something similar to give it something a little more. Saying that, there is so much more on this afternoon tea tier that it’s not much of a problem! The next course offered freshly baked and still warm scones. Two fruit scones, two plain scones, all served with homemade clotted cream, strawberry jam and a very welcome addition of lemon curd. I’ve never considered that there are people out there who do not like jam… Jen is one of those weird individuals hehe! 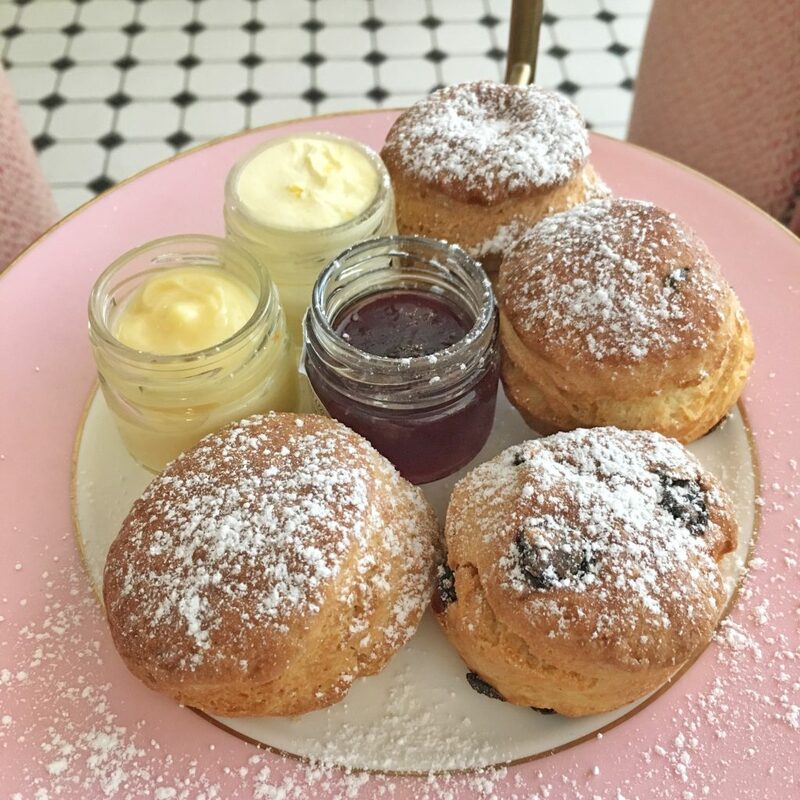 But she was thrilled to have lemon curd served with her scones, such a lovely little addition. After all of those breaded goodies, there’s then the top tier to dive into. The cakes. All miniature and bite-size, however we struggled to eat them all – there’s a huge amount of food on these plates, not that we were complaining about this of course! 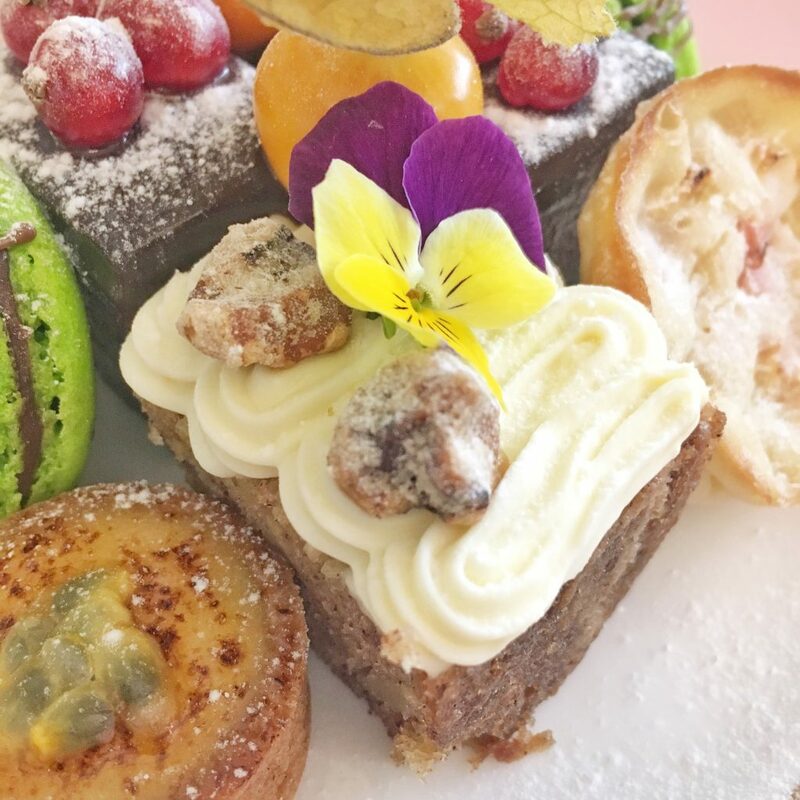 We tucked into a triple chocolate layered brownie, chocolate and mint macaron, passionfruit tartlet, a rhubarb soufflé, classic carrot cake with walnut and colourful edible flowers on top and a chilled rhubarb & mango parfait. Each and every one of these treats were pleasing to the eye, my favourite being the layered chocolate brownie which was just divine. It was rich, smooth, and light enough to eat in one go… I could’ve had more of this, if I’d had room. The passionfruit tartlet packed a punch, the pastry was perhaps a little over-baked, but I quite liked it. You could taste the passionfruit and it was very different to any tartlets that I’ve had before on an afternoon tea stand. The chocolate & mint macaron had us divided, with Jen not being a huge fan on this one, but I loved the richness of the chocolate inside. We did however agree that you couldn’t really taste the mint in this, a bit of a shame. The carrot cake was delicious and a gorgeous traditional touch. 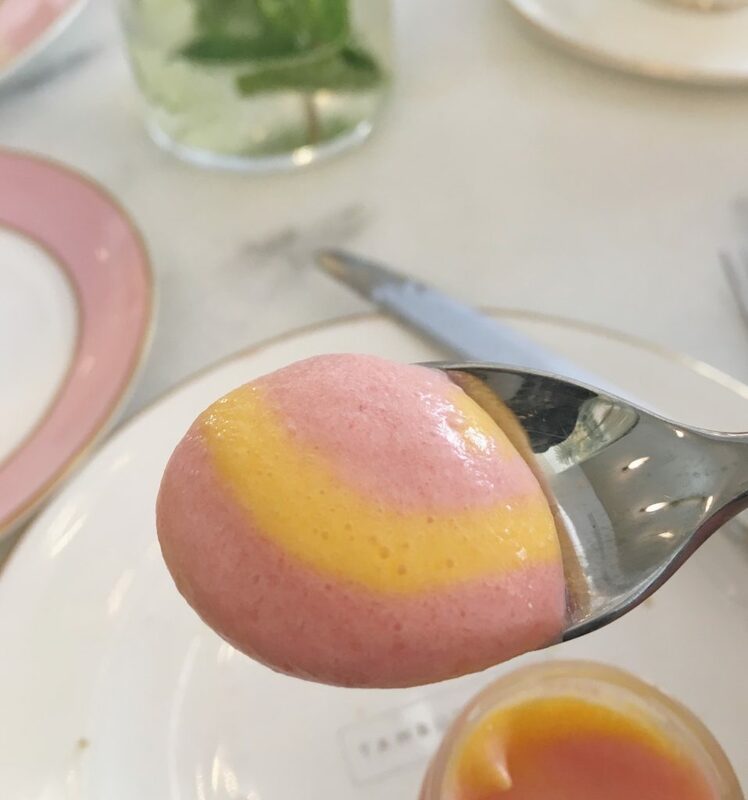 The rhubarb soufflé was pleasant, but the most unusual element was the mango and rhubarb parfait. It tasted very synthetic in flavour and I do think perhaps something a little less adventurous here may go down better. The bright colour was very appealing, but I don’t personally think it worked too well overall… and Jen agreed. Perhaps a posset or a less strong flavour would work better here, I’m not so sure. 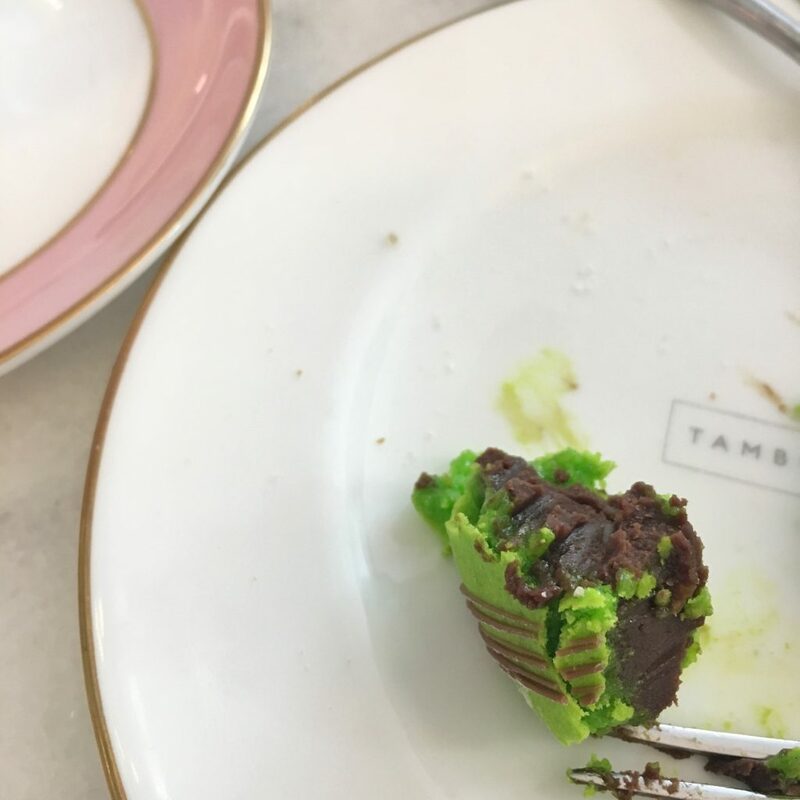 Saying that, I just loved the colour on this cake plate, it all just looked so appealing and we wanted to scoff it all in one go, not ever really sure where exactly to start…and if you are an Instagram fiend like myself, then this is the cake plate for you! As I mentioned earlier, we couldn’t finish all of the cakes so we took some home for later. We were provided with two dainty little card boxes with lids and these kept our cakes fresh and intact for a second wind later that day – perfect. 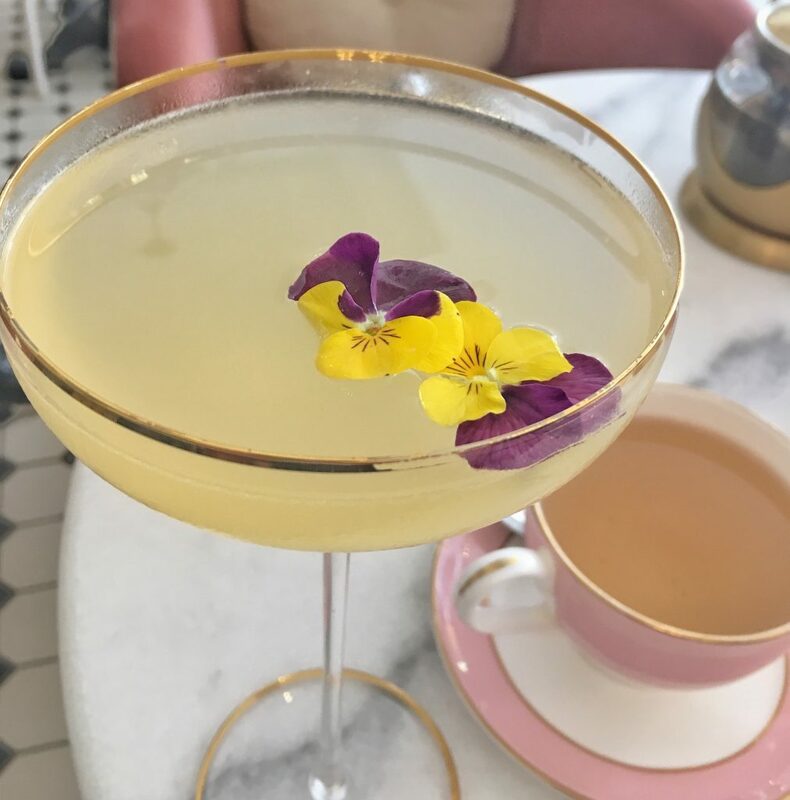 Cocktails are also served alongside afternoon tea here, and our friendly waiter served us two beautiful cocktails decorated with edible flowers which just looked too stunning to drink. Both of us were unable to drink alcohol on this day, we couldn’t sample them, so he offered us a non-alcoholic cocktail instead. Now, these mocktails were just as beautiful as the cocktails, and not your usual juice mixed with soda water. No. We were served a homemade Kombucha (distilled tea) with fresh mint, soda water and cucumber – this was one of the most delicious drinks I’ve ever had the pleasure of being served. 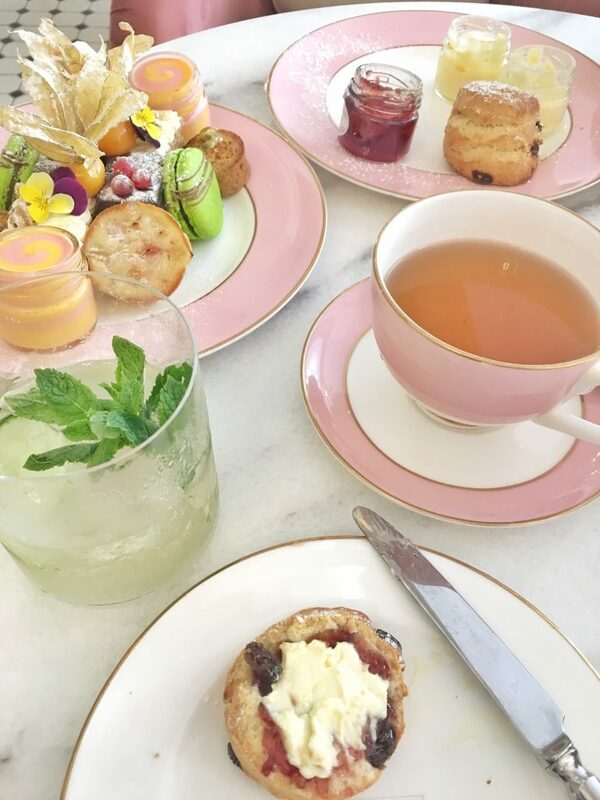 It worked perfectly with our sweet treats and I would highly recommend ordering one with your own afternoon tea. On serving our cocktails, the waiter did ask us the reason why we couldn’t drink the alcoholic cocktails. I have fed this back to the hotel, as it felt a little awkward/intrusive as we had to turn them away (such a shame, as they looked so good!) and had we known these were kindly being served, we could have let them know we wouldn’t be drinking alcohol on this particular day. The only thing that lets them down at the table is the fact that the sugar is not in cubes, but in those horrid little packets as you would expect at a Starbucks, it just didn’t look very nice on the table when everything else was so beautifully thought out. It’s a very small niggle and it may sound silly, but when you are as geeky as I am about afternoon tea you will agree with me on this one. One thing that really was lacking in the garden room was atmosphere. There was a sophisticated hen party celebrating on the table next to us and perhaps one or two other tables of two people quietly enjoying their afternoon tea. There was no background music once the hen party had left the room halfway through our own afternoon tea, the silence felt a little uncomfortable and we felt like we needed to whisper so as not to disturb the other people around us. Perhaps some quiet background music would do the trick, I’m not too sure, but what really did surprise us was the fact that the Garden Room was so empty on a Saturday afternoon… Where was everybody? For a Saturday, I would have expected this hotel to have been bustling, but nevertheless this was our gain as we got to enjoy the hotel to ourselves, pretty much. 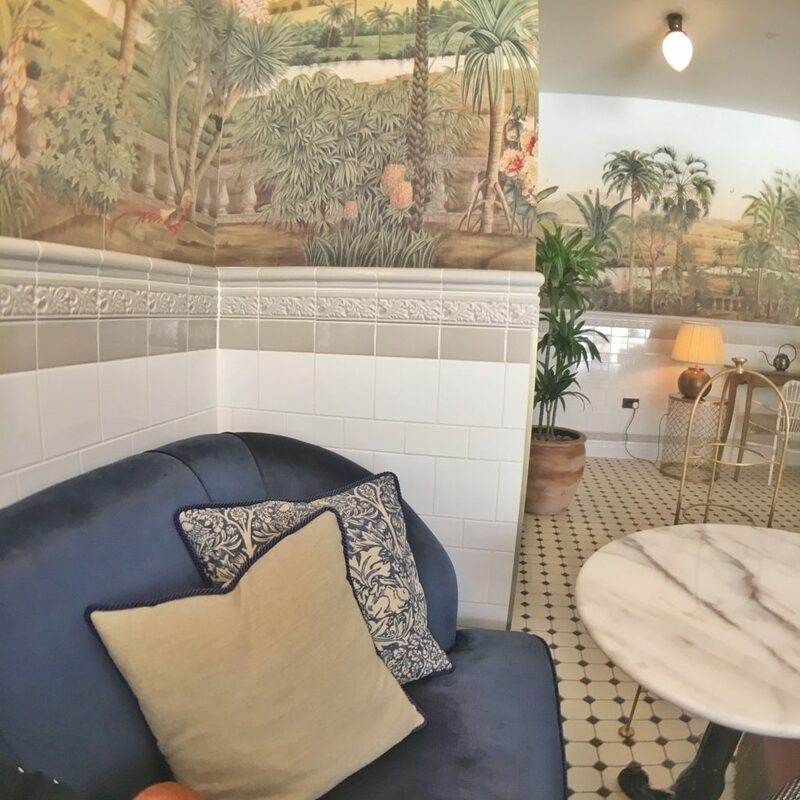 The French doors were open, allowing a nice fresh breeze to blow through on a hot day, however on various occasions, several drunk kids walked through finding it hilarious that they were gatecrashing to find the toilets as they passed the hotel. When you look out of the French doors, it simply overlooks a concrete path outside, so some herbs, plants or some sort of planter would be a lovely addition to extend the garden room and have something nice to look out onto. But a very small niggle nonetheless. 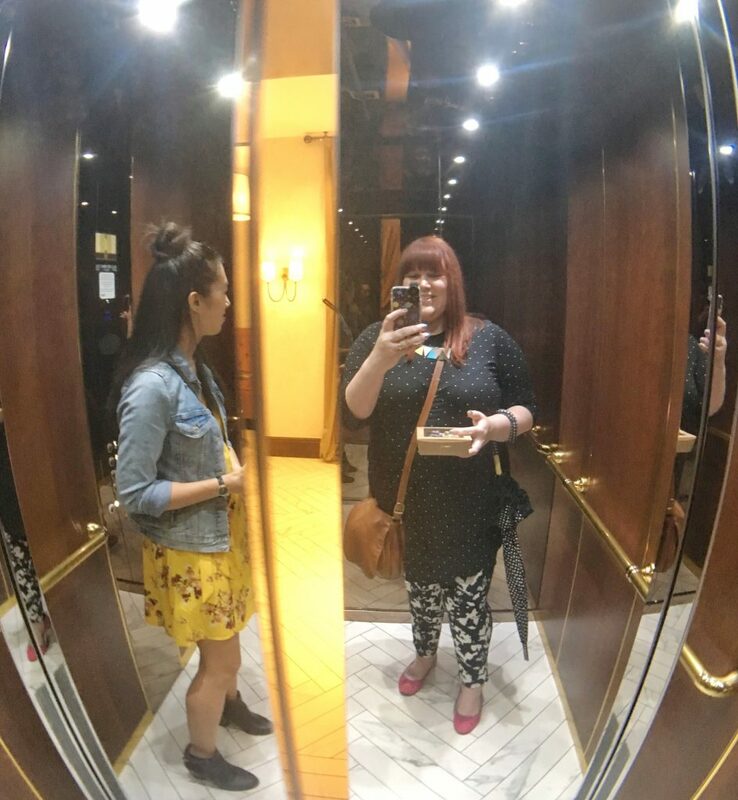 The staff here were very polite, leaving us to our own devices for most of our stay. They did the same with the other tables around us, which made for a very relaxing experience. There was always somebody on hand when we needed them for a top-up of tea for example. 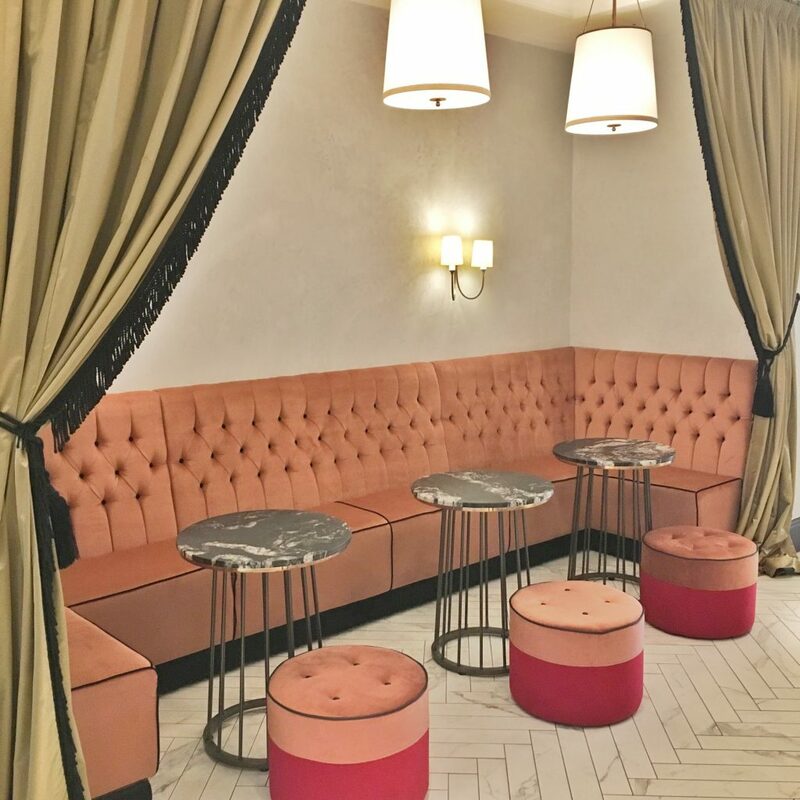 But I liked that they didn’t hassle anybody – once you are seated, you’re left to relax and not be quizzed every ten minutes. 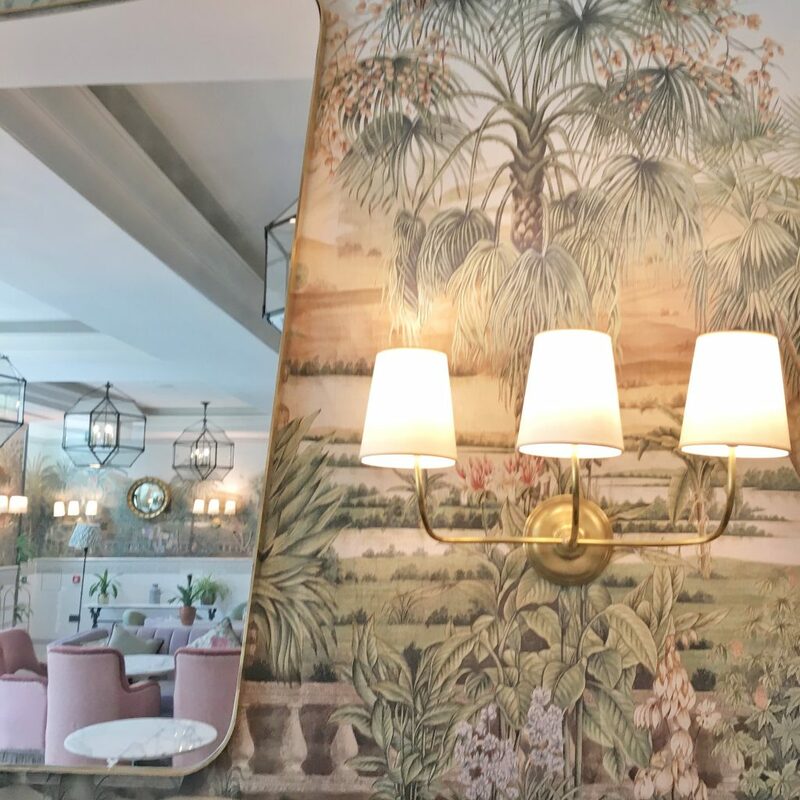 We loved exploring The Tamburlaine, the afternoon tea in the Garden Room was stunning, I highly recommend it – I will be going back very shortly with some more friends! 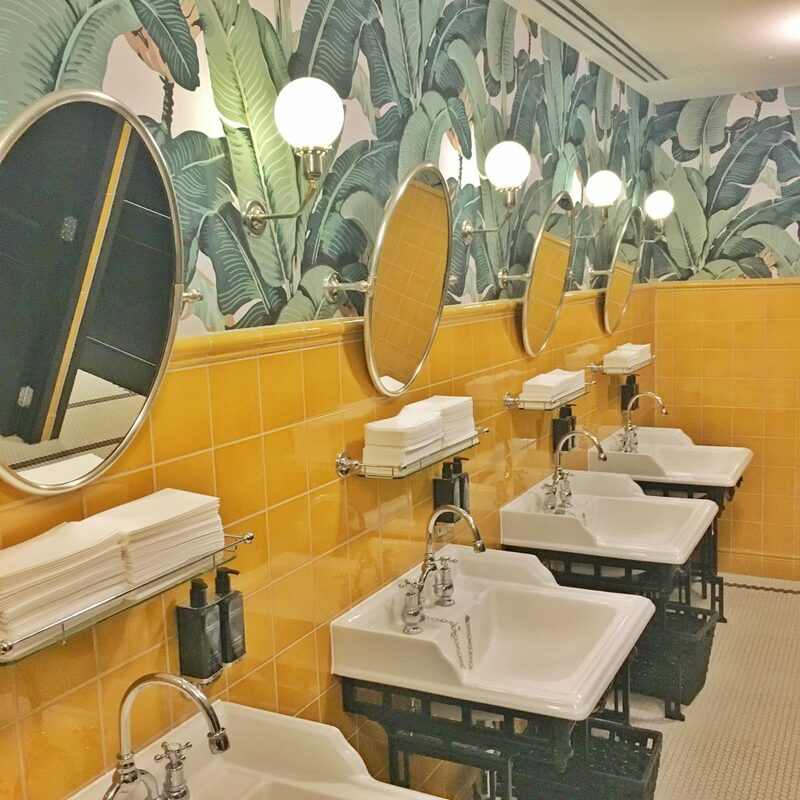 If you get chance, I know this will sound odd, but check out the toilets as you leave, they’re stylish and colourful and were fantastic new home inspiration for me! 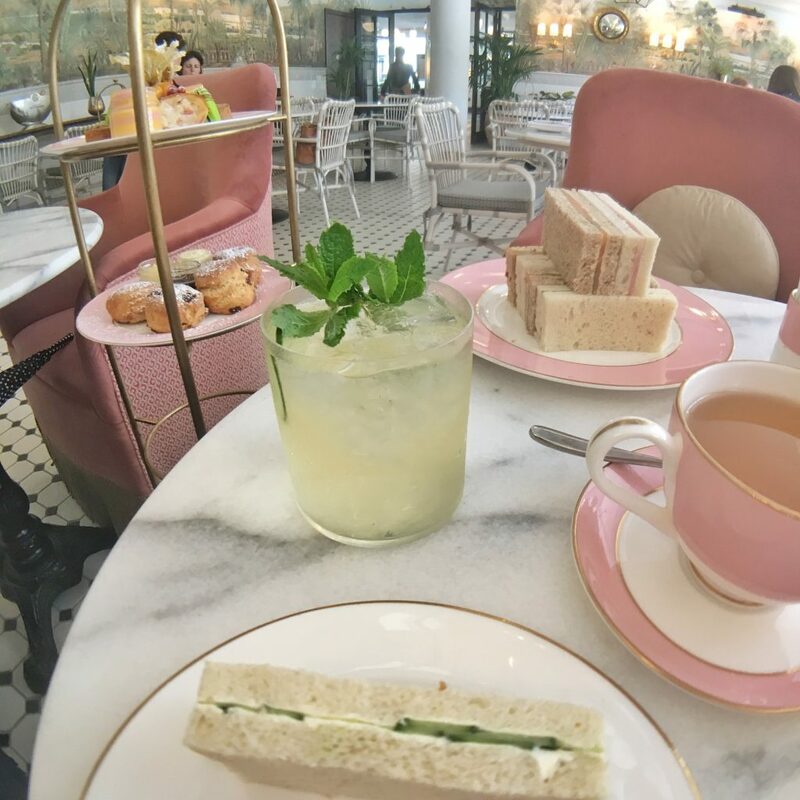 Whilst dining here, I had fun making some mini videos on Instagram to showcase this afternoon tea. 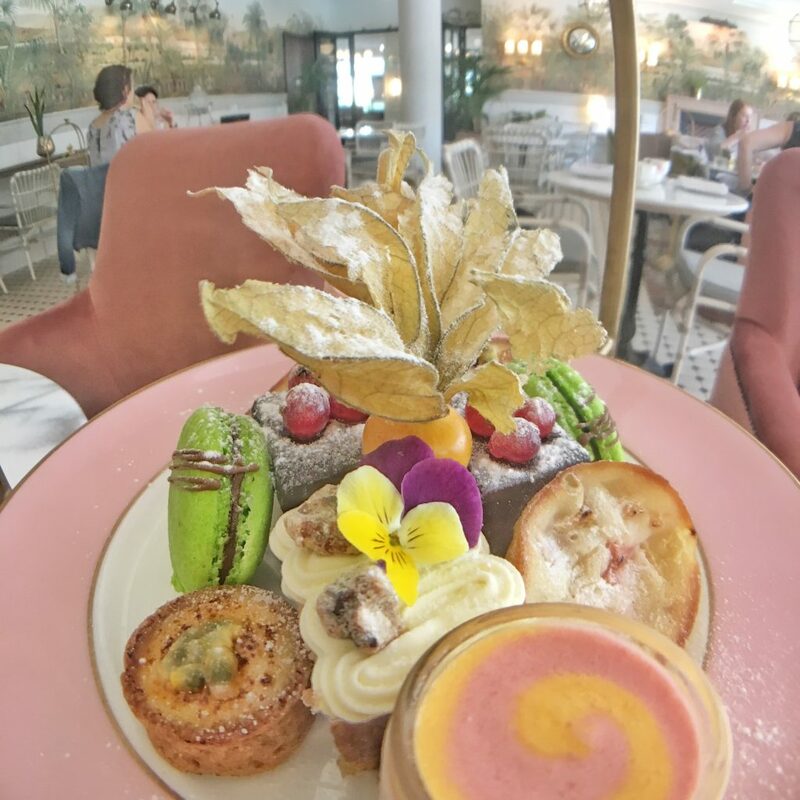 Visit my Instagram Page here and click on the “High Tea” section in my bio to take a nosey and see this fabulous afternoon tea streamed live (at the time of visiting) for a different perspective – enjoy! 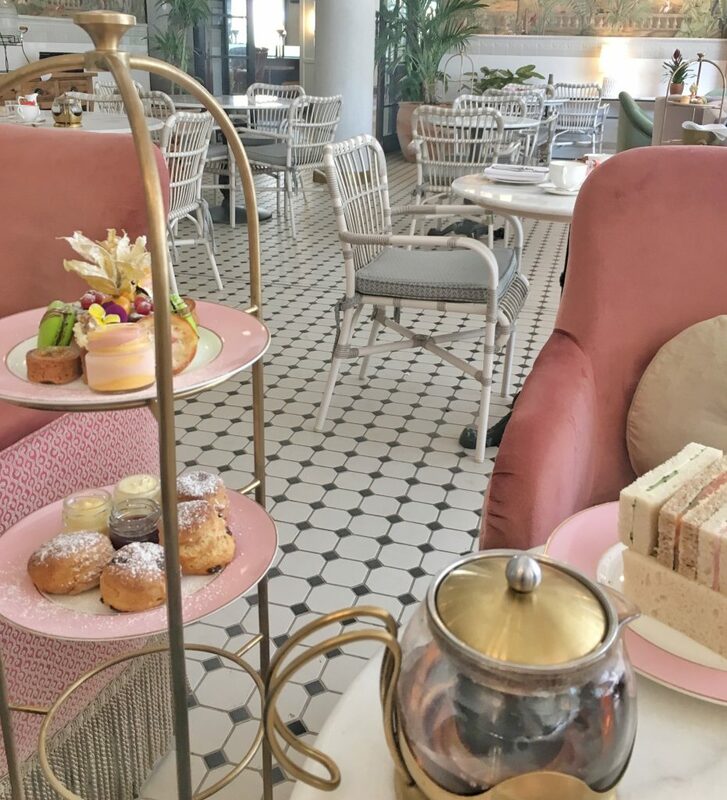 A huge thanks to the team at The Tamburlaine for inviting us to sample this afternoon tea, this has to be one of my new favourite spots in Cambridge. 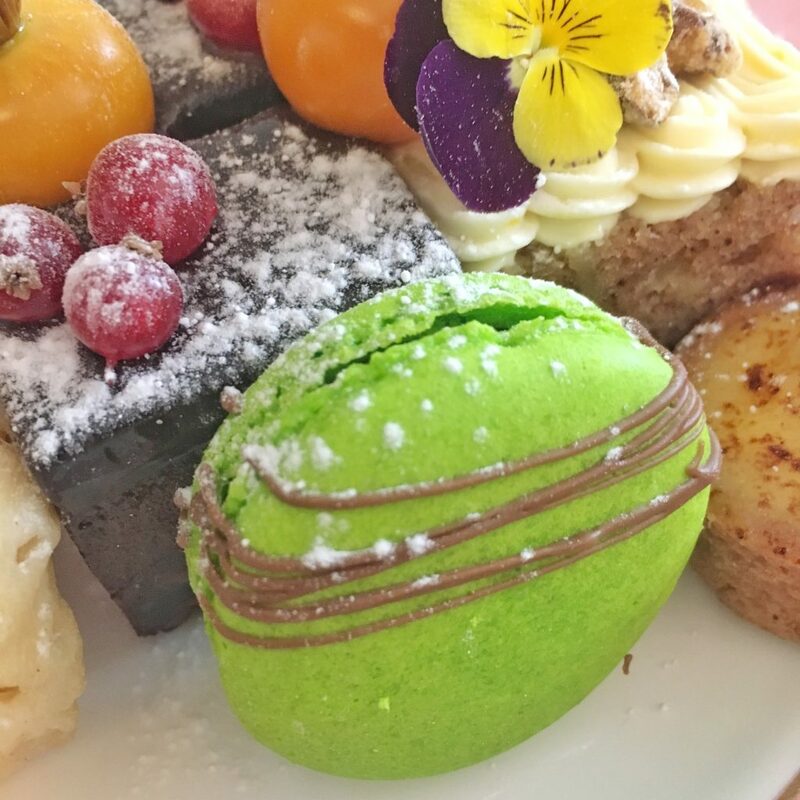 Afternoon Tea is served daily between 2pm-5pm and currently costs £9.50 for a cream tea and from £29.50 per person for afternoon tea. 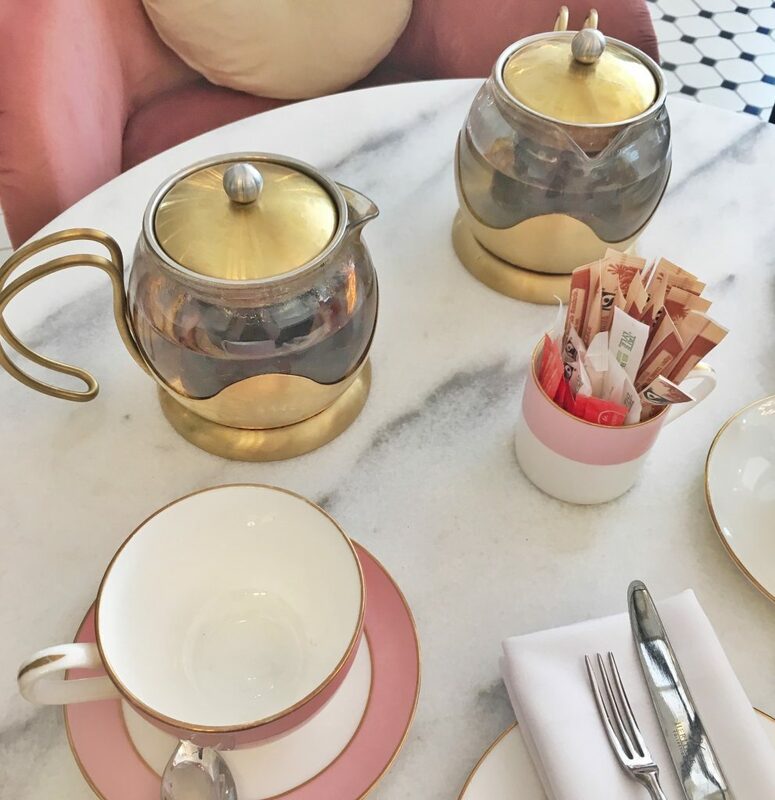 Have you been to The Tamburlaine for afternoon tea? See my full Facebook photo album for this visit here! Please note – This visit was complimentary following an invitation from The Tamburlaine. I am in no means obliged to blog or write about their offerings, but I simply choose to share with my readers, should I enjoy the experience. A huge thank you to the the team for welcoming us, we very much enjoyed our afternoon tea experience.